Quality Ball Bearings for fishing at an affordable price with secure check-out! Sports anglers around the world demand quality fishing components. At Ball Bearing Swivels we provide the quality anglers expect when they purchase ball bearing fishing swivels. Our fishing swivels are made of high quality stainless steel with precision ball bearings to make sure your fishing lure or bait does not twist up on the line. 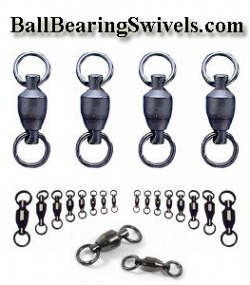 We offer many sizes of ball bearing swivels to meet almost any angling situation. Thanks in advance for shopping at BallBearingSwivels.com. You can find other great fishing products at pointwilsondartwebspecials.com, deepstinger.com or supersquids.com.